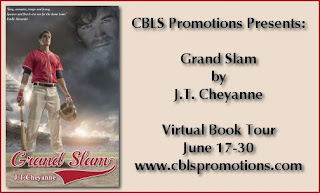 herding cats & burning soup: Spotlight: Grand Slam by JT Cheyanne! All of his life, Spencer Hightower dreamed of playing baseball in the Major Leagues. He survived growing up gay in rural Alabama due to his impressive skill on the baseball diamond. Now living in Rhode Island and playing for the AAA Pawtucket Red Sox, he's only a few steps away from his goal. Brock Kinkaid, CPA, faced each day with a smile that hid his deepest desire. He wanted to be a father. Unfortunately, the gay men he knew were not into the daddy scene. Resigned to being childless, he lavished his attention on his niece and nephew. When Corey won tickets to see the local baseball team in action, they suckered him into taking them despite the fact he loathed the game. Who would have guessed one home run ball would change everything? 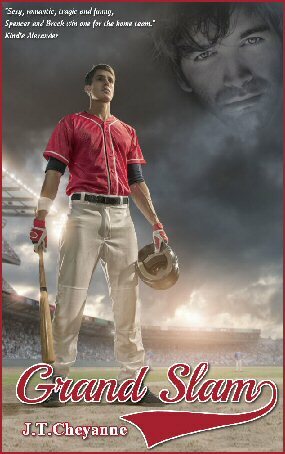 Grabbing his courage by the horns, Brock grasped Spencer’s hips and urged the man to straddle him. Spencer came willingly, settling his weight across Brock’s lap, pressing down against his throbbing engorged shaft. Brock needed skin, needed to feel the warmth beneath his palms. Frantically, he tugged Spencer’s shirt up. Spencer broke their kiss long enough for the material to slide over his head. Those plundering lips returned to Brock’s mouth before trailing across his jaw and feathering down over his throat. Brock’s head fell back against the sofa to give Spencer more access while under his palms, smooth firmly muscled thighs rippled as Spencer changed the angle of his approach. Brock explored the corded abs, tight pecs and broad shoulders before moving to trail his fingertips down Spencer’s bare back. The waistband of Spencer’s loose Levi’s stopped his exploration. After a lifetime of reading and at the suggestion of friends, J.T. finally put fingers to keys and started writing her own stories. It's been a wildly amazing ride full of tears, exhilaration and plain old hard work. Thankfully, her three beautiful children support her craziness and encourage her to continue something she loves. While they both have solo work, J.T. also writes with V.L. Moon and she thrives on the work they do together. What a small world it is indeed Mr. Disney when a small town girl from Alabama can find and write with a big city girl from England. What a ride it has been and continues to be! SooOoo what did you think of the excerpt? June 20: It's All About the Romance!